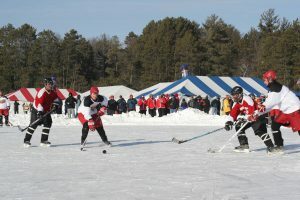 USA Hockey and Labatt Blue invites you, your teammates and families to enjoy the experience at this year’s 4 on 4 Pond Hockey Championships held on Dollar Lake. The Eagle River Fire Department creates 30 specially marked rinks for this exciting event bringing participants from all over the United States. In 2017 there where approximately 300 teams face off in 20 non-check divisions with over 2,000 enthusiasts competing.